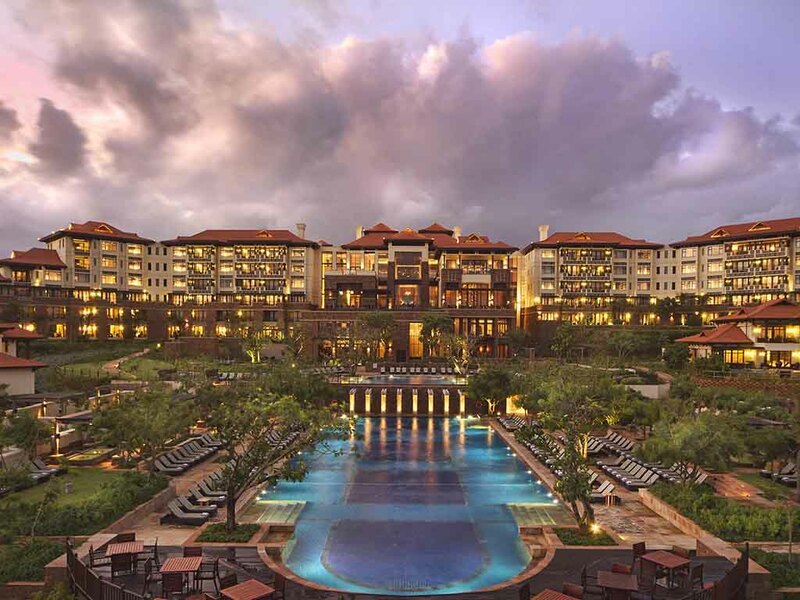 Set along South Africa's sublime east coast, nestled between a forest reserve and a shimmering sea, the resort's exquisite natural beauty is dotted with pockets of urban flair and enhanced by the rich Zulu heritage of the KwaZulu-Natal province. Our 154 well-appointed rooms offer scintillating views of the Indian Ocean, oversized verandas, and elegant decor of stone, wood and earth tones inspired by the areas breathtaking natural surroundings. Coral Tree Restaurant is renowned for its attractive cuisine and daily buffets. The extensive covered terrace offers breathtaking views of the Indian Ocean and the natural beauty of the area. Coral Tree offers elegant dining in a relaxed setting. Enjoy the fragrant, flavoursome cuisine of India prepared from recipes handed down by generations of Indian chefs. Savour the signature Butter Chicken or enjoy a traditional Thali. Each dish uses a unique blend of spices and herbs. Central American flair meets Africa's legendary hospitality. Ayoba Restaurant makes meal times and every other time in-between a fiesta of Mexican flavours. Bite poolside deli, caters to the coffee connoisseur. Perfect for an early morning coffee and pastry, or breakfast for those with time to linger. Lunch options include a selection of deli sandwiches, wraps, salads and burgers. This contemporary wine bar and cocktail lounge is the perfect venue to sip, mingle and relax while enjoying the spectacular views of the Indian Ocean. Dalchini is the quintessential lobby lounge and the perfect place to curl up with a book, or catch up on emails while admiring the Indian Ocean through the floor to ceiling windows. At 31 Degrees cocktail lounge, the perfect cocktail is inspired by both bar and kitchen and devoted to fresh local ingredients. Our signature cocktails are measured with precision, shaken with style and garnished with passion and craft. MaKhaza is the quintessential beach bar with a casual cocktail mood that flows seamlessly into the early evening, complimented by flavorful meals from Ayoba. Sit back and enjoy a cocktail while the cool Indian Ocean's breeze sweeps over you. It was super awesome. Love d valet system. Breakfast was great. N staff were super friendly. No sense of urgency when it came to service. Check in - kept waiting for a while whilst there were 2 staff members behind the desk but only 1 working Housekeeping and operator phones rang unanswered. Staff promises to deliver with requested items to the room- not honoured. The service is not on par and hygiene standards are not being upheld. On our second night we ate at coral tree only to find a cockroach in the buffet area,this was pointed out to the staff but no one seemed to care. Throughout our stay the service at the resorts restaurants and bars was not up to scratch. After seeing the cockroach at coral tree we decided to dine outside of the hotel. On the last morning my partner went for breakfast at coral tree (to give it another try) only to find dead cockroaches in the buffet area. There should not be cockroaches where there is food! Not under any circumstances as this is not in keeping with appropriate health standards. The only good service we received at the resort was from the concierge. Our stay was very disappointing and honestly a waste of money we will not likely return as we would rather spend our time and money elsewhere. Something really needs to be done about the poor restaurants at the resort and the poor service at these establishments. These restaurants are ruining the resorts reputation! While the resort is beautiful, it's beauty alone is not enough for anyone to return. The standard of service needs to be uplifted. In addition one of the plugs in the room blew my Ghd and there was not even a note on the plug and we were without a working room phone for 2 days of a 4 nights stay. 1. Booked for 2 adults and 1 child, room with a bed couch / extra bed, but this was not what we were given and the staff at reception did nothing abut this issue, they ended up not answering our phones from the room, it was 11 pm when we arrived, by midnight nobody showed up nor did anything with our situation, our son is 10yrs old at that time. (Leroi was working on this night) 2.We asked for late check-out by an extra 1 and half hour, the hotel staff at reception was niggly about this, our son had an event at Crawford and he needed to finish at 12, then come back to shower so we can leave, they could not grant us this, waayyy disappointing. 3. went to relax at the pool area early morning, the café / bar staff does not attend to guests at all, you have to follow them around. our experience was really an unhappy one. Poor. Sunday night and only one place to eat and only expensive wines on the list. Total rip off. The hotel was great. Clean rooms, friendly and helpful staff. Must admit that this was a huge concern, after reading the Tripadvisor posts. Service at the poolside was poor as there was only one waiter on site. This was disappointing. 08h30 calls from the marketing team with regards to visits around the estate was really unnecessary especially when one is on vacation! Buffet at the Coral Tree restaurant was good. The deck area where we ate breakfast could have been cleaner. Overall a good stay..
lovely , i just did not enjoy the persistent calls from property sales. This is a superior hotel and we thoroughlty enjoyed the stay. Beautiful rooms and venue, great service and food. Beautiful stay at the suite. Amazing views! Will definitely be back. *Check in process - Frustrating and long especially when you have a cranky 3 year old. The Booking.com confirmation did not agree with your system. We booked a Deluxe Sea view room with sofa bed and was told on check in that these room types never come with a sofa bed & I would need to pay an additional R500 for an extra bed for my toddler. After retrieving my Booking.com confirmation to prove we had indeed a sofa bed included - we were contacted later that afternoon to offer us an upgrade to a Junior Suite which didnt suit our requirements - my 3 year old was not going to sleep in the next room on a sofa bed! I needed an extra bed in the same room. * Reception staff - not very friendly or enthusiastic. *Queues at Breakfast to get a table - never in my 21 years of traveling have i had to queue to get a table for breakfast at a hotel! *Breakfast dining area - dirty floors and staff also not very friendly or enthusiastic. Another European couple complained to a Manager about the hygiene in the dining area of the restaurant. * Torn Bath Towel in room (sorry but no hotel should have torn towels yet alone a Fairmont hotel) - I have pictures of your torn towel if you would like to see. * We ordered Room Service just before 8pm - was told it would take between 30 - 45 min - food arrived 1 hr 30 minutes later at 9.30pm. By then my son and husband were asleep. I love Zimbali, have stayed in the Lodge before and now the Hotel and sad to say - your grounds and beautiful surroundings are certainly 5 star but that's about it. The only friendly, welcoming people were the Porters! We were recently asked to recommend a place in Ballito for a Honeymoon couple and without hesitation recommended Zimbali. Since this last stay , I can no longer with confidence recommend your hotel. * Your hotel staff lack enthusiasm and spirit - perhaps it was just too busy or they don't really care. A guest pays for the full experience - not just a room in the hotel! Mostly good, booking was a little inefficient as I had to follow up on a booking confirmation after I had emailed the EFT confirmation for a 50% ‘securing’ deposit. Restaurants are extremely expensive. The lack of a proper swimming beach in the estate is a pity. My one pyjama top/t-shirt went missing after our room was serviced. Assume it went out with the washing. No-one followed up or called back after it was reported. service levels and hotel has really gone down. Although location is superb, the rooms feel a bit dated. Second time we stay there and both times we had a problem with our room provided. The sleeper couch was very uncomfortable the rugs were smelly lights in the bathroom and air con not working correctly. If I’m to pay premium price I at least expect premium accommodation.